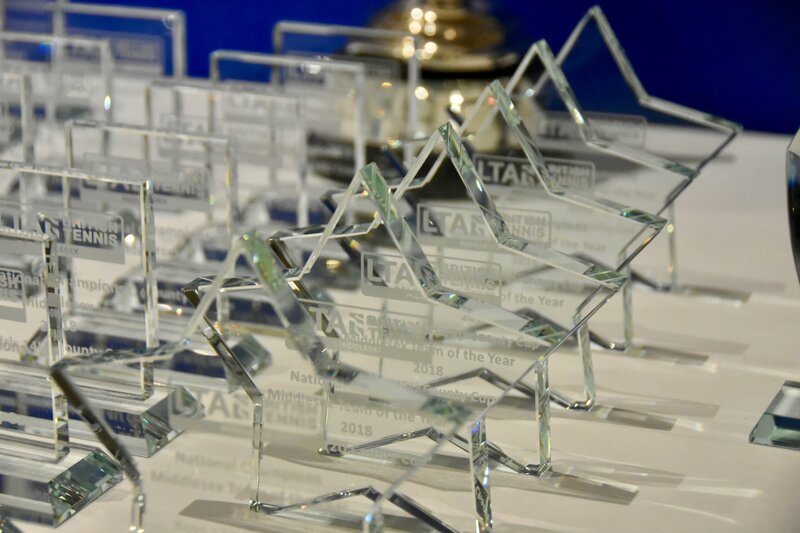 Recognise the people, clubs and organisations who have made your year in tennis outstanding. 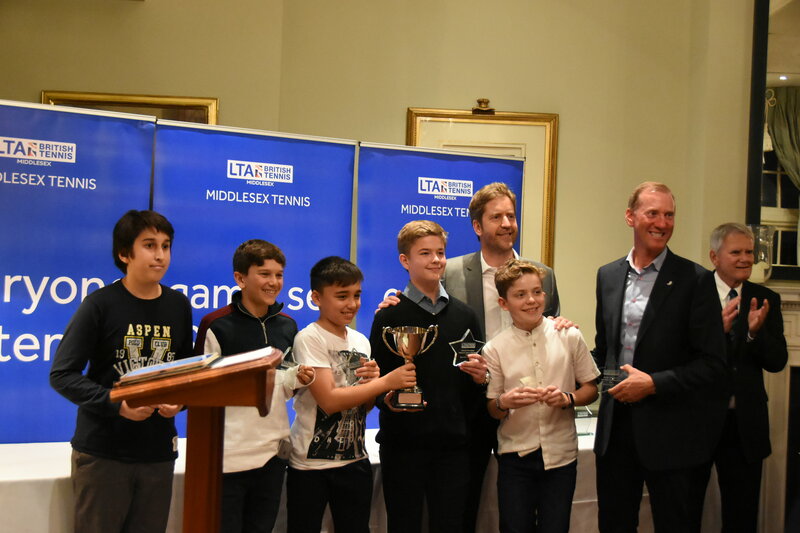 Each year Middlesex Tennis recognises success within the County and the contribution that people make to that success at all levels of the game. ‍The awards fall into 3 main categories; 10 British Tennis Award winners, the Middlesex Tennis Competition Awards and the Performance Awards. The British Tennis Awards were introduced 4 years ago as a way of recognising and rewarding individuals, clubs and organisations for their contribution to the development of British Tennis. Television presenter Marcus Buckland was on hand to present the 2018 awards at the Queen’s Club. 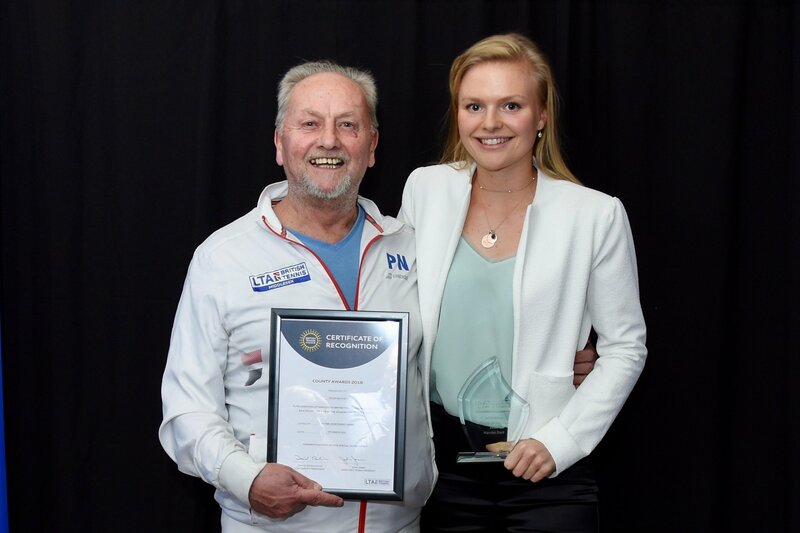 The 2018 Player of the Year award went to Harriet Dart who reached the semi finals of the 2018 Wimbledon Mixed Doubles, qualified for the Australian Open and was selected for the 2019 Great Britain Fed Cup team. Peter Neathey received the Lifetime Achievement Award. Peter’s coaching journey started in the late 1980’s on park courts in North London before he was recruited to work for the next 15 years at South Hampstead Tennis Club in Brent. During his time at South Hampstead he coached and played an integral part in the development of top players such as Alex Bogdanovic, Anne Keothavong, Luke Milligan and Harriet Dart. All of who have gone on to compete at Wimbledon and had international success. Playground Tennis provides free Mini Tennis sessions to primary school children in West London. Their unique programme delivered sessions to around 4,000 primary school children last year providing them with a fun and enjoyable introduction to tennis. Westway work in partnership with the LTA and Middlesex Tennis to offer high quality, affordable tennis sessions to young autistic people as part of their “ACEing Autism” programme. The community venue selected to receive this award embraces and excels at many of the LTA tennis programmes that are available, these include the Quorn Family Cup, Team Challenge events, Miss Hits sessions and Tennis Tuesdays.In 2018 they delivered 18 Tennis for Kids courses across their 4 community sites in the Borough of Richmond all of which were sold out resulting in 180 new children taking part in tennis. This competition was introduced to the Middlesex tournament schedule last year with the objective to increase the number of Mini Tennis Red players competing regularly.All matches played as part of this tournament schedule feed into a Leaderboard with the top boys and girls invited to a final at Paddington Recreation Ground alongside the Middlesex 14 & under Road to Wimbledon Final. This provided a great opportunity for players to play against other top players in Middlesex as well as developing friendships with other players and parents. Emily had a very busy 2018 completing no fewer than 60 days as a Chair and Line Umpire. She has performed at all levels of the game including Wimbledon and the Fever Tree Championships at the Queens Club. Away from these prestigious events she worked at a local club level assisting with tournaments at Our Lady of Muswell, Finchley Manor, Cumberland, Hurlingham and Totteridge to name but a few.In August last year she qualified to become internationally certified as an ITF White Badge Chair Umpire. The Volunteer of the Year Award went to Marina who has been an active member of her club, Gunnersbury Triangle LTC,for the past 30 years. During this time she has adopted various roles and is currently chair of the tennis committee. She has provided vision, structure and energy to the committee that has seen extensive refurbishment of the club's facilities both on and off court and a 25% growth in membership over the past 2 years. Hrithik has assisted as a volunteer with the tennis coaching programme at David Lloyd Northwood for the past two years.In addition to helping with the coaching sessions he also assists with tournaments and the club’s schools outreach programme. Happy to turn his hand to whatever needs doing, often working off his own initiative without the need to be asked. He is an asset to the coaching programme at Northwood and is an inspirational young man who has all the qualities to succeed in whatever chosen profession is lucky enough to attract him. Membership at this club has grown from 22 to 240 over the past 6-years. This is in no small part due to the hard work and commitment of this club’s volunteer committee and head coach.They are a very community focused club, growing their membership base mainly via word of mouth within the local area. With only 3-courts and being tucked away they are often referred to as the ‘Best kept secret in Finchley’. The Middlesex Individual and Team Competition Awards go to players and teams who have excelled in Middlesex County Competitions and Leagues over the past year. Competition is at the heart of all counties with over 8 000 players competing in Middlesex Team Competitions. 2018 Road to Wimbledon Girls County winner: Leo Silverston. 2018 18 & under Girls County Championship winner: Veronika Hughes. 2018 18 & under Boys County Championship winner: Maxwell Douglas. 2017-18 Middlesex Tennis Winter Mixed Cup: The Queens Club. 2018 Middlesex Tennis Women’s Summer Cup: The Cumberland Club. 2018 Middlesex Tennis Men’s Summer Cup: The Queens Club. 2018 Middlesex Women’s Summer League: The Cumberland Club. 2018 Middlesex Men’s Summer League: The Lensbury Club. A number of awards were made both to individuals and teams to recognise and celebrate success in the area of performance tennis. Maxwell Douglas, Oliver Foran, Mark Miscevic, Louis Quaynor, Mattias Southcombe Captains: Shola Roper, Otto Buchholdt.